Just fill out the form and run the application. No install or uninstall necessary! Address minor issues before they become big problems. 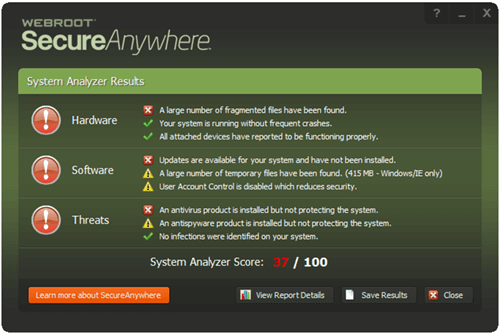 Webroot® System Analyzer quickly pinpoints security, hardware, or software issues—identifying malware infections, flagging outdated drivers, and establishing a security baseline. Fast and accurate, you can run the System Analyzer any time to assess the health and security status of the PCs in your environment.